The Fleet's In was the featured program at the infamous Pomona preview where The Magnificent Ambersons unspooled before a hostile audience, the show a shambles because the mob wanted music/comedy and not a somber evocation of elite decline circa past century Indianapolis. According to witness recall, these onlookers at Ambersons as Welles conceived it either razzed, laughed or walked out. A couple more sneaks told RKO loud and clear to chop The Magnificent Ambersons from over two hours to less than ninety minutes. We wonder how a great film like that got made when everyone who'd see it was one shade or other of cretinism. Too easy for enlightened us to dump on insensible them. You'd think all of classic movies were pearls cast before mass public swine. Of course they ate up loutish The Fleet's In and rejected The Magnificent Ambersons. That's how benighted 40's viewership was. The Fleet's In as Pomona's Judas goat becomes mere something Hollywood wasted resource on when they should have been issuing blank checks to Orson Welles. 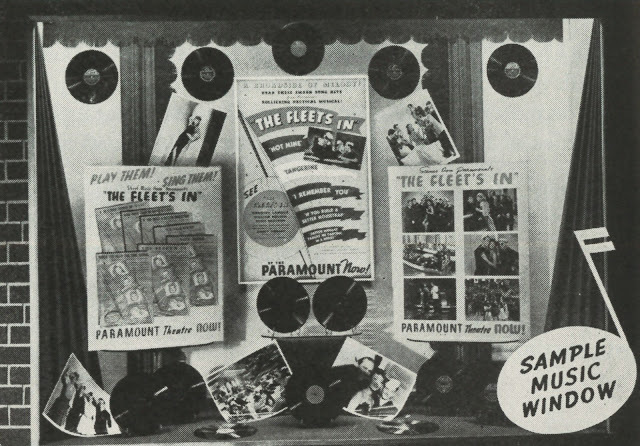 And yet The Fleet's In was what they did prefer to whatever Welles did, a mood-of-moment thing to be sure, March 17, 1942 the seat of shame in Pomona. Ambersons was an add-on to The Fleet's In, not the attraction folks paid to see. 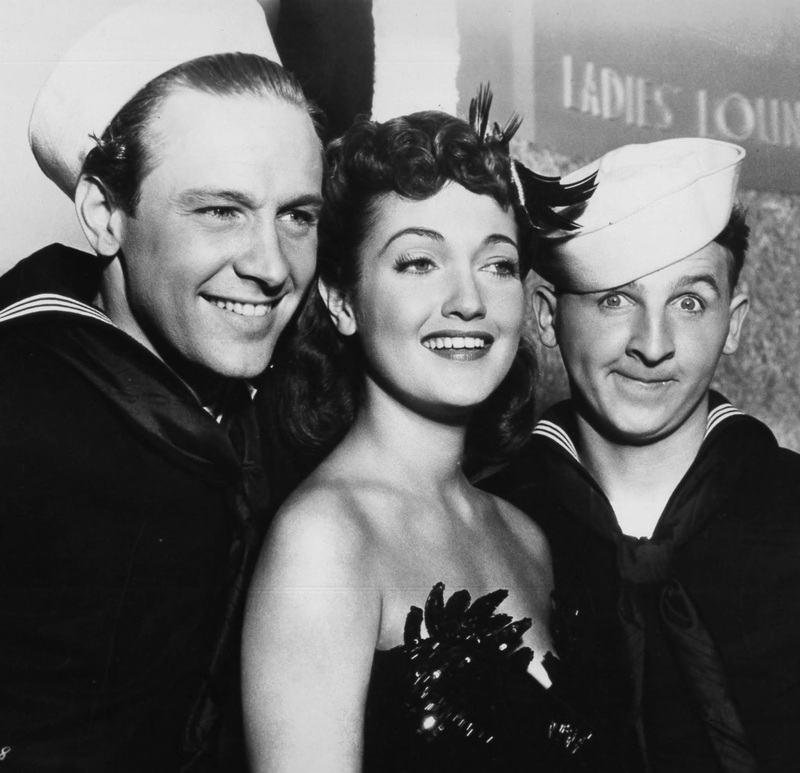 They were there for fun of Dorothy Lamour and Betty Hutton with Eddie Bracken and big band Jimmy Dorsey. These could not have been worse bedmates for the Ambersons. It was like some Axis power snuck ashore to do mischief on our moviegoing habit. The Fleet's In was enjoyed a lot more then than it could be now, a sort of invisible ink among better regarded artifacts of the day. Who could look longingly back at such a thing, and yet some would, maybe for personal circumstance that made The Fleet's In part of a happy evening out. I've seen diary and scrapbook entries where a clipped ad or image from a since forgotten show is captioned with "Really good!," or "Saw it with Betty last night and we loved it!" If you venture near The Fleet's In today, better put on your 1942 goggles, because that's an only way of even beginning to understand appeal it once had. Think Eddie Bracken was funny? Well, millions once did, including a writer-director we've since called genius, Preston Sturges. 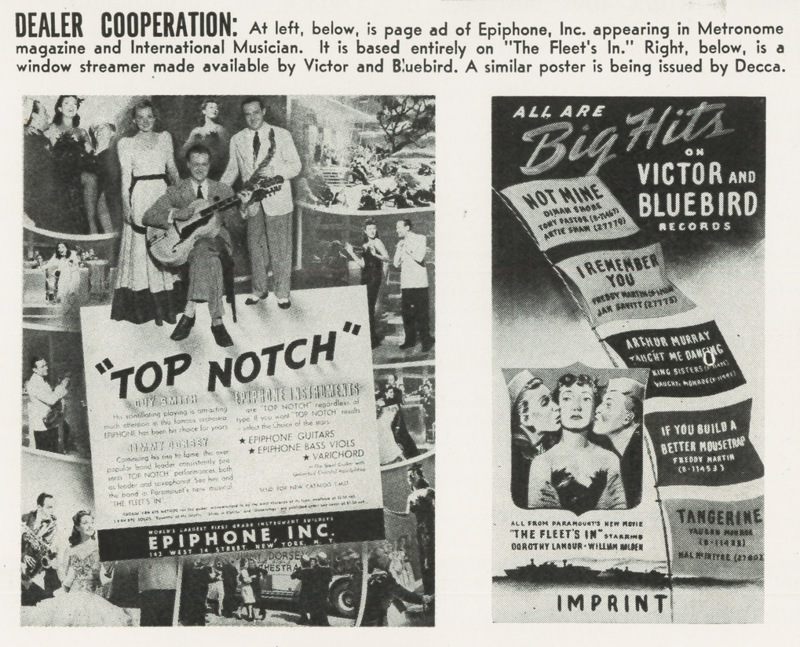 Betty Hutton seems less energized than plain nuts to modern eyes, and history records she did go a little starkers toward career finish, but for verve, zest, zing, whatever polite substitute for madness we'd call her, Hutton was exactly what a wartime public was primed for. The Fleet's In is historic for, if nothing else, getting her truly started as a decade-long star attraction, because attract she truly did. Of Bracken, I'll say less. Had he been active ten years earlier, Eddie might have been part of insufferable ensemble that was Hal Roach's Taxi Boys. He'd do many "vehicles" beyond Sturges comedies best recalled. Were it not for those, would Eddie Bracken be known at all? Ocean Wave Is Right, with Krupa and Connee Boswell In Addition To The Fleet's In. Ever Wish They Still Had Conga Lines? I Do. 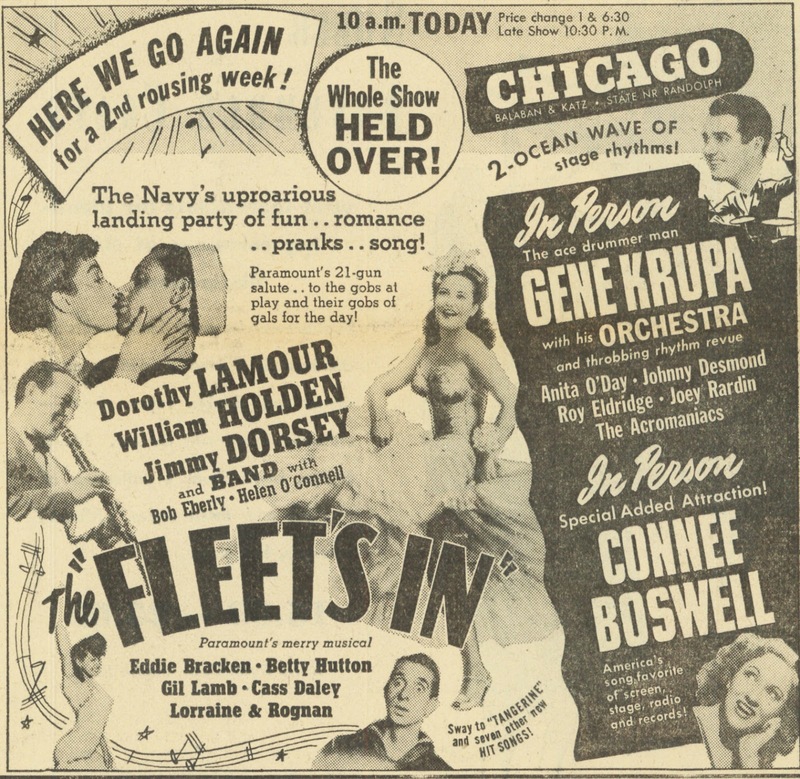 The Fleet's In has run at least twice on TCM, for which there's no accounting, but happy are days when any pre-49 Paramount is sighted and seen. 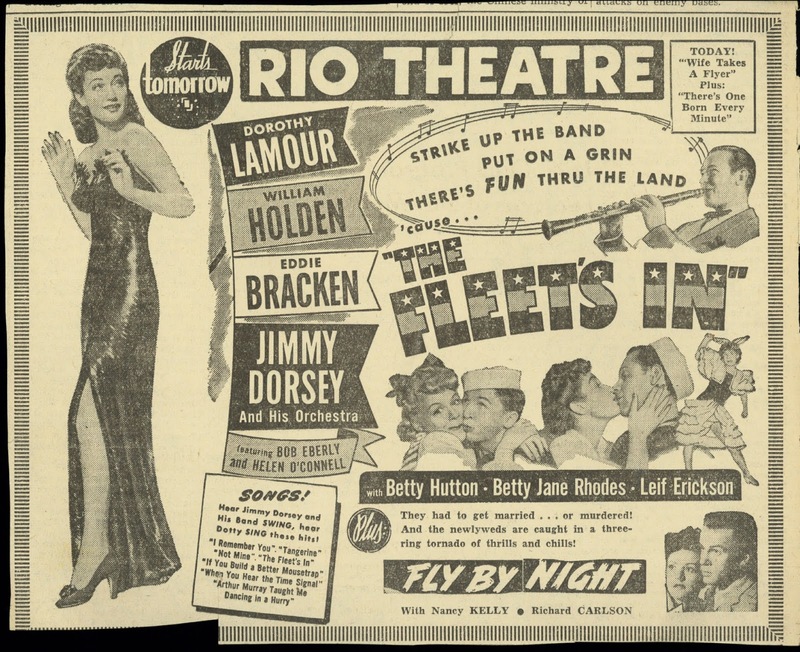 This one was their idea of a revue, sort of a wartime Paramount On Parade, with oddity acts to humble even Hutton: dance team Lorraine and Rognan, fated to a same plane crash that disabled Jane Froman the following year, Cass Daley of boisterous voice and teeth that alarm, Gil Lamb who appears to swallow his tiny harmonica, then plays it. All this was vaudeville in an oxygen tent supplied by the present emergency. So who said variety died with arrival of talkies? Far as I can see, the war brought vaude back in big ways (think of acts doing camp and front line work), this continuing to dawn of television, latter a rescue of show-biz as known since the 19th century. The Fleet's In is peerless record of talent called back from what history thought was oblivion. A truly good act could engage as readily in 1942 as 1888, especially ones of freak persuasion. 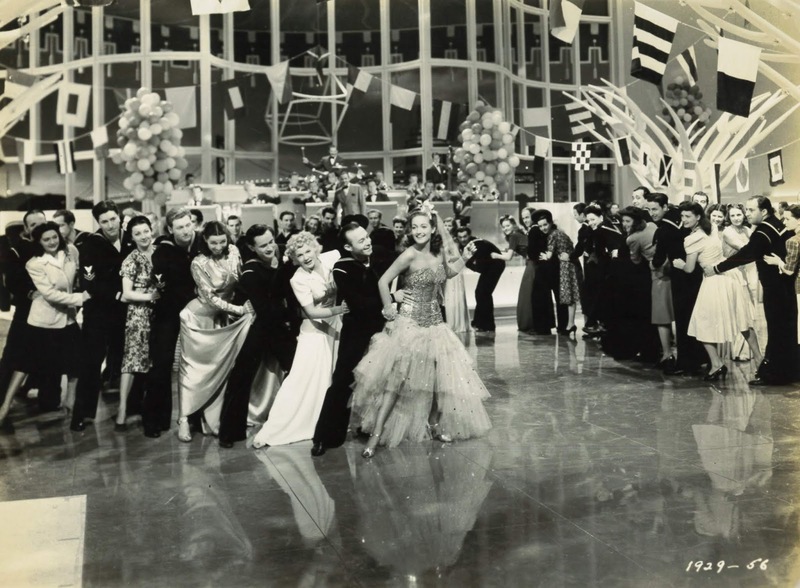 If performers did not themselves date back to start of vaudeville, they certainly learned from those who did. 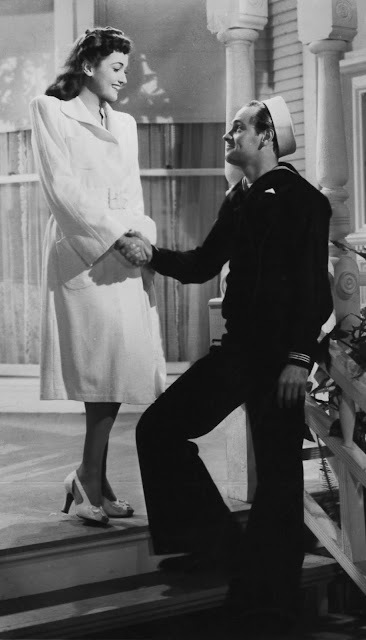 The story in a peanut shell: Bashful gob William Holden (who surely offered a knuckle sandwich to anyone who mentioned The Fleet's In to him in later years) gets tagged as lothario after a starlet leaves lipstick on him for a publicity stunt in which he's not complicit. 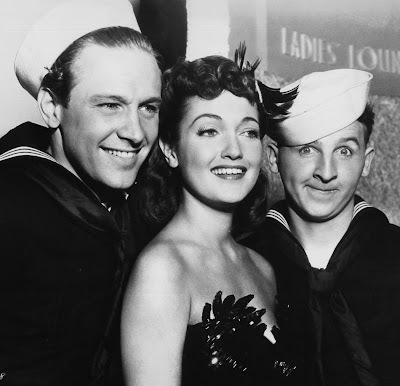 From there, Bill is dared to harness a kiss from chilly songstress Dorothy Lamour, from there an hour of misunderstandings and kiss/slap/kiss to numb all but most forbearing of watchers. 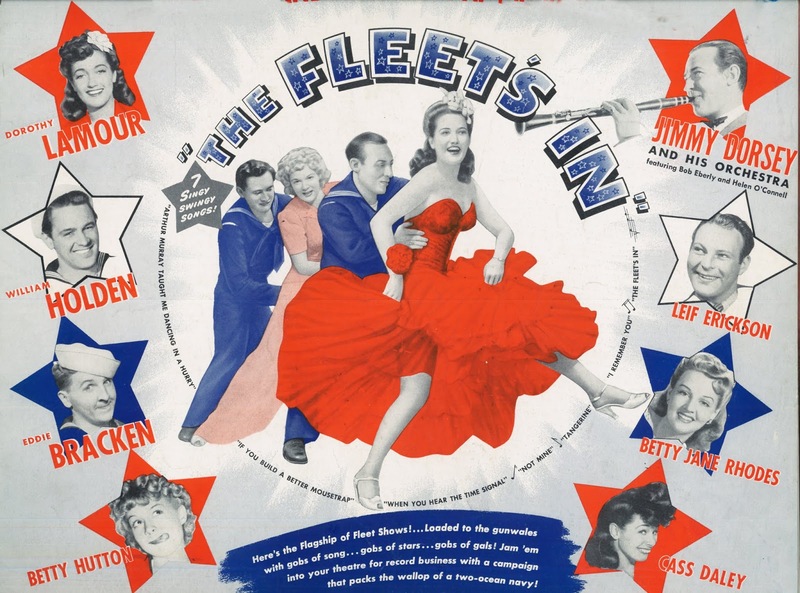 There's no mention of actual war, The Fleet's In a finished job before Pearl (released January 1942). In that sense, it benefited in much a same way as To The Shores Of Tripoli and early arrivals with the luck of perfect timing. Maybe Orson Welles should have done a service musical, an It's All True set in west coast night clubs (more I think about this, the less kidding I am over the idea). Bet among sailor pals over whether Holden will kiss Lamour, and in public, was a gag destined to be reused as late as Elvis and G.I. Blues, but surely won't be again, The Fleet's In a further distance from our culture than lots of silents we could name. 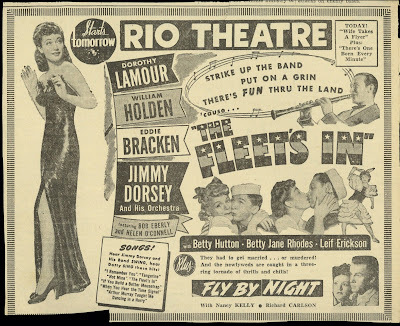 Narrative stops cold for a third act recital of all screwballs from the bill, so strap in for one after another of acts you truly had to be in 1942 Pomona to love, all backed by Jimmy Dorsey and the Boys. I'm at point of floating a theory that live performers got more and more like cartoons as war heated up --- honestly, some of these were like Daffy Duck or Olive Oyl translated to live action. We are never going to know times like this again. Always fascinated by wartime fascination with geeky, gawky and graceless comediennes. Not only does THE FLEET'S IN thrust Betty Hutton onto the big stage but they throw Cass Daley and Jean Lorraine in the mix too. Overkill much? 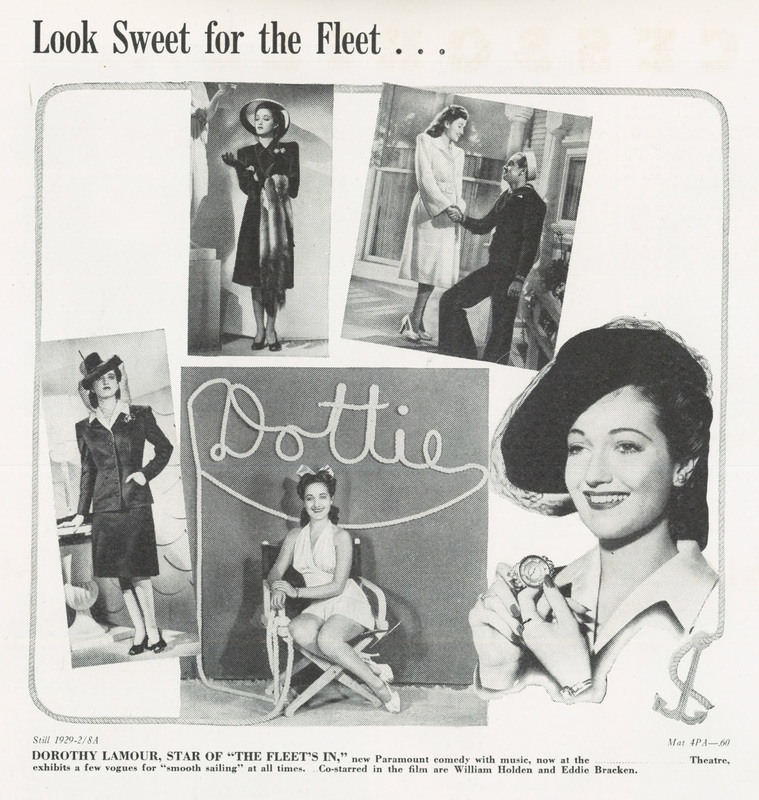 Most of the performers in this category had considerable comic chops, even great comic ability (Martha Raye, Joan Davis et al.) But sometimes it seems 40's Hollywood wasn't as interested in these ladies being funny so much as just being overpowering or grotesque. Is there some sort of women-on-the-home-front-taking-on-all-sorts-of-men's-work-including-over-the-top-knockabout-shtick social message here? Sorry in advance for the long post! I saw this on Channel 5 WNEW in NYC, back in the early 70s. I still recall the opening lines of the title tune, "Hey there mister, you'd better hold your sister, cause THE FLEET'S IN". Touching story: director Victor Schertzinger, longtime Paramount mainstay, died during production. He was also a top songwriter (MARCHETA, LOVE PARADE, this film). They were filming a number (possibly I REMEMBER YOU?). Dorothy lip-synched to the playback, but someone left it running after the take was done; everyone then heard Victor praising Lamour's rendition at the recording session. I don't think anybody was able to finish that day. Amazing how people of any era can go for crap movies (and they say that people of the present do that.) I know which movie I'd prefer if I was in that time period (and was able to, as a black man, go to a movie theater that had a special night for black people)-it would be The Magnificent Ambersons. I've always thought Welles should have alternated movies: one for him, one for them. Maybe follow up "Citizen Kane" with "War of the Worlds" (or, better yet, vice-versa). 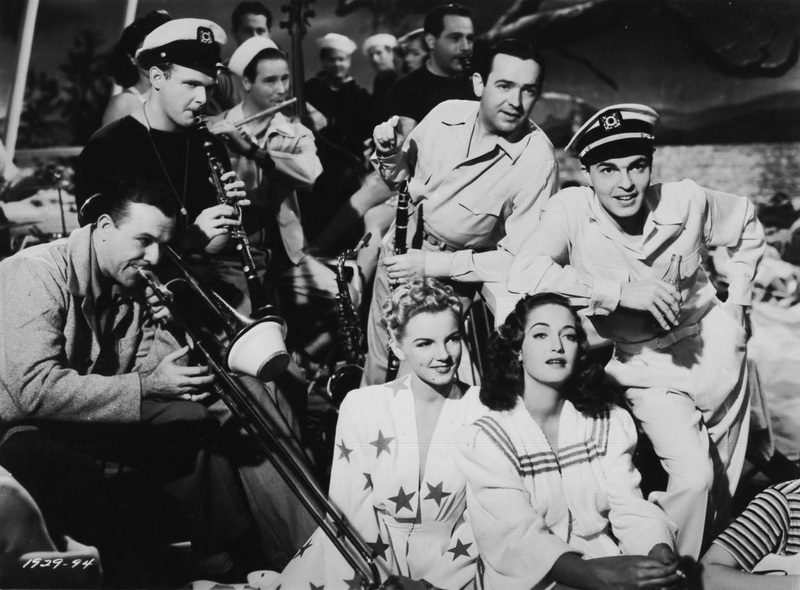 As for Eddie Bracken -- maybe he needed a writer/director like Sturges to bring out the best in him. Kind of the way Adam Sandler is often quite good in something that isn't an "Adam Sandler movie". Certainly Eddie Bracken was popular in the '40's. I recall my late father telling me that Bracken was one of his favorites during that time period. As a child I remember seeing "The Miracle of Morgan's Creek" and "Hail the Conquering Hero" on TV and thinking Bracken quite funny. Then again I was a child of the '50's, raised on early TV sitcoms, so my youthful perception of funny was informed by that. If young and hapless Eddie Bracken were born 15 years earlier, he would have been perfect for such TV fare in the 1950's and early '60's. I've always wondered about that really aggressive mugging-for-the-camera-while-singing from the 40s...where did that come from? Especially in the case of the ladies. I used to think it was everyone being inspired by Mickey Rooney...then I saw Hollywood Hotel and Johny Davis acting like a Tex Avery character while singing...so clearly its not Rooney's fault. It seems to have mellowed out by the early 50s. The problem is seeing the movies as only an entertainment medium. The greatest motion pictures like the greatest books and the greatest works of art including music are much more than entertainments.